As debates about Moonlight/Silverlight carry on, we thought it would be reasonable to bring up this new interview with the President of Mozilla Europe. Marketing: Unfortunately the best product does not always win and unfortunately, getting open-source products in the hands of users is a hard task. Also, established, closed-source software vendors do their best to prevent open-source from spreading. They use a number of techniques to achieve this. The first is about formats and interoperability. The game here is to prevent competing products accessing files data (files or documents) created by a proprietary application. For a long time, this issue was more important in the office applications realm. Now we are in a connected world, this issue has extended to new domains like network protocols (SMB/CIFS for printing and file sharing, for example), Internet applications (Microsoft Silverlight applications running in the browser, requiring a proprietary plug-in) and Digital Rights Management. The second technique used by proprietary players is in the legal field, using software patents and royalty schemes and open source software is often unable to respond. For example, embedding a piece of software requiring a royalty-fee codec (such as a video) breaks the open source nature of the code, because it prevents redistribution. Right now, such methods are being used by some vendors and are threatening the open source model. I think open source has a great future if it manages to ‘avoid’ these threats. As individual users, we need to make sure that the products we adopt are open source: In today’s world we are ever more dependent on technology and keeping it open is the best way to master it in the long term. It is rather amazing to see how hard he tries not to name Microsoft, referring it as “some vendors”. Do you know why? Because if he points a finger specifically at Microsoft, people will call him a “zealot”, a “bigot” , a “fanboi”, a “Microsoft basher”, or even a “conspiracy theorist”. These are well-known methods for stealing attention from those who ‘dare’ to criticise abuse. Over the years, this was the technique used to paint people black because they told the truth. Just look at the personal attacks on Nicholas Negroponte and even Richard Stallman. But anyway, let us stick to the main subject again. 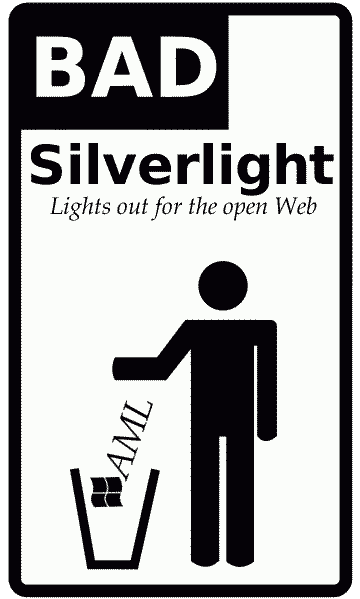 “Anything Novell does is likely to be tied to Microsoft’s long-term ambitions.”So, what is this Silverlight/OOXML/XPS/HS/Sharepoint stack all about? Should it blindly be embraced by GNU/Linux? Will Novell sell us patent ‘protection’ for it? Do we get a discount if we exclude and subtract Mono protection (some of us don’t use it anyway)? Novell is not doing so well financially these days, and it was looking for ways to make more sales. We mustn’t forget that it willfully became a vassal to Microsoft (and it shows). Anything Novell does is likely to be tied to Microsoft’s long-term ambitions. Novell still hopes that Microsoft will save it from drowning. Remember a certain struggling company called SCO? Unfortunately, Novell made the wrong decision, even from an egocentric point-of-view. Sales have not improved sufficiently and Novell resorted to book-cooking as means of drawing a deceiving and optimistic picture. That aside, the entire GNU/Ballux deal has been a case of Novell ‘distinguishing’ itself by FUDing competing Linux vendors along with Microsoft. And just look at the consequence. Microsoft now knows how to get paid by everyone, using Novell as ‘proof’ that GNU/Linux has what Steve Ballmer referred to as "obligations" (to Microsoft). As a general note, OpenSUSE will be fine even without Novell, but only if volunteer developers keep up th good e work or defect to create a separate company that capitalises on SUSE’s codecase independenly. One thing to watch out for is this gotcha (watch bottom part about a pledge to OpenSUSE developers, which is atrocious). No wonder the (Open)SUSE folks are so afraid of the FSF. It’s probably reciprocal because the FSF is quietly angry at Novell. Watch this cheap shot from SUSEForums. It’s part of a pattern of smears that sometimes involve the GPL, sometimes the FSF, and sometimes Groklaw. We covered some other examples here before [1, 2, 3, 4]. Warning: This interview contains Richard’s view of reality, which may or may not match the reality you’ve observed. Novell has been hoping to find and buy forgiveness using good deeds. Novell continues to contribute but also to detract. We mustn’t accept this risk which involves Microsoft milking money from all Linux vendors and threatening large companies until they shell out money secretly (oh yes, they do! ).